At the time of writing this I had been in Senegal for a couple weeks checking in our programs, working to develop our staff here, and exploring opportunities with new partner communities and organizations. It has been a belated, but decent rainy season here and the millet and peanut fields are coming in well. Our programs in Keur Soce are thriving this year and we are adding more every month. Our staff has taken these new challenges in stride and are making new things possible. This year has been one of growth for us, and we are hopeful that we can continue to expand in the future. 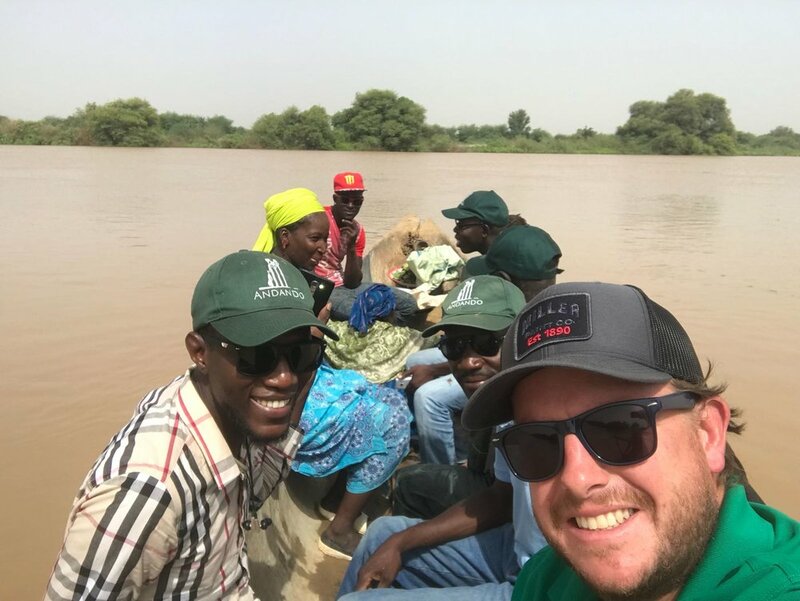 Crossing the Doue River to see a new health post at Dado. Recent rains have washed out the roads. One area of recent expansion that we are very excited to announce is the launch of Andando programs in a new part of Senegal! In July, we broke ground on many new projects in the Podor region of northern Senegal (see map below). Working with a partner - the Vibrant Village Foundation - and backed by your support and generosity, we are embracing this new chapter as we seek to strengthen more communities. As with our programs in Keur Soce, we have spent years laying the foundation in this area by first developing relationships and "testing the waters" by operating our microloan program in the area, with fantastic results. This process, which has been about five years in the making, allows us to develop partners in the area, ensure support and community backing, and guarantee success and sustainability as best we can. Construction of a garden basin at Mbantou Croissement. This new venture marks a significant step for us and we hope you will join us in welcoming these new communities into the Andando family. We are by no means leaving our programs behind in Keur Soce, and have really only scratched the surface of the potential of the communities there. We have made lifelong friends in Keur Soce and will continue to walk with them to meet myriad needs and continue to invest in their potential. Keur Soce will remain the center of the bulk of our operations, but we are excited for this new growth enabled through your continued support! Thank you, and I hope to see you all very soon at the dinner and silent auction on October 25th! Newer PostThank You the Dinner and Silent Auction was a Great Success! Older PostNew Health Posts Ready to Open!